After more than 15 years of vibrant production and wide appreciation outside the 'established' culture, its a bitter sweet kind of legitimisation to see Banksy exhibiting to the brow. Whether this flows on to become a legitimisation of street art generally - specifically stenciling, culture jamming, bugger up and empty shows remains to be seen. 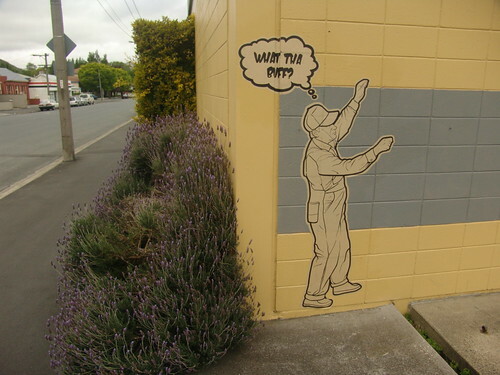 Perhaps it will help delay the grey paint strokes that are wiping out good quality Dunedin street art all too regularly. Highly unlikely I guess.. so we rely on the galleries protect and elevate it. Galleries exist (in part) to protect artistic expressions from the less open minded. Its just been a shame that the galleries themselves have struggled for so long to open their minds!